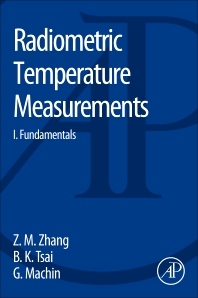 This book describes the theory of radiation thermometry, both at a primary level and for a variety of applications, such as in the materials processing industries and remote sensing. This book is written for those who will apply radiation thermometry in industrial practice; use radiation thermometers for scientific research; the radiation thermometry specialist in a national measurement institute; developers of radiation thermometers who are working to innovate products for instrument manufacturers, and developers of non-contact thermometry methods to address challenging thermometry problems. The authors of each chapter were chosen from a group of international scientists who are experts in the field and specialists on the subject matter covered in the chapter. A large number of references are included at the end of each chapter as a resource for those seeking a deeper or more detailed understanding. (4) understanding of the calibration chain and its current limitations. Benjamin K. Tsai graduated from Brigham Young University with a BSME degree in 1987. Next, he obtained a MSME degree in 1990 at Purdue University by completing his thesis on “Dual-wavelength Radiation Thermometry: Emissivity Compensation Algorithms.” In 1993 he finished a PhD degree at Purdue University with a dissertation entitled, “Macroscopic Spread Function Analysis for Subsurface Scattering in Semitransparent Materials.” Since that time, he has worked in the Sensor Science Division at the National Institute of Standards and Technology. His interests and projects have included development of a new irradiance scale, developing the ambient background infrared calibration laboratory, setting up high heat flux calibrations, making accurate temperature measurements in rapid thermal processing, modeling diffraction effects, performing low-temperature radiance temperature and spectrophotometric calibrations, evaluating skin reflectance, understanding ageing effects in ceramics, setting up a synchrotron beamline, and improving spectrophotometry in the SWIR using extend InGaAs detectors.